Importantly, an additional 570,000 Oregonians had their voter registration records updated when they submitted a change of address through the OMV.10 This helps keep the voter registration lists up-to-date and more accurate, and protects the integrity of elections while ensuring more Americans can have their voices heard and exercise their power at the polls. While voter registration does not guarantee voter participation, CAP estimates that about 87 percent of people who were registered to vote reported voting in both 2012 and 2016. It is instructive to compare the relatively small vote differential between winning and losing candidates to the number of new registrants projected to be added in each state in just the first year with AVR. 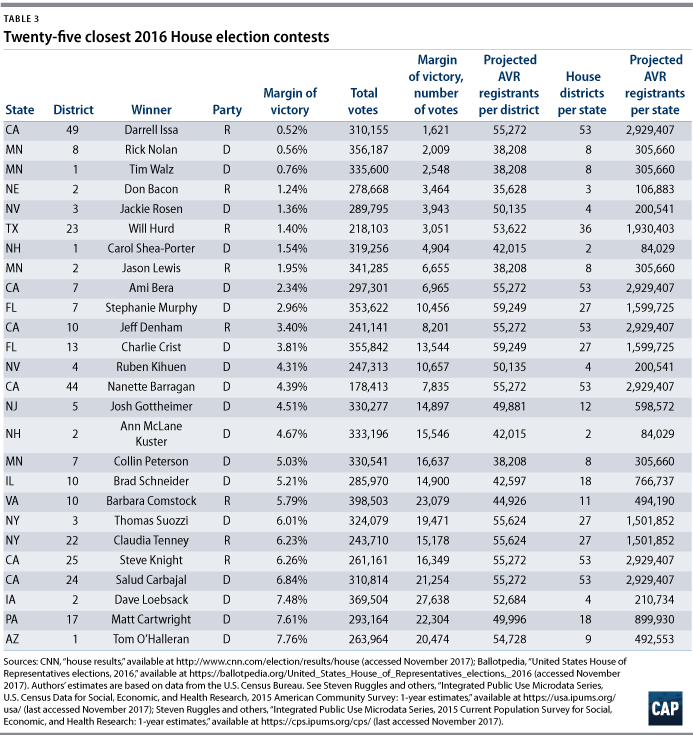 For context, this brief looks at the 10 closest 2017 Virginia House of Delegate elections and the 25 closest congressional elections for the House of Representatives in 2016 and compares the currently missing voices who could be brought into political decision-making with AVR. 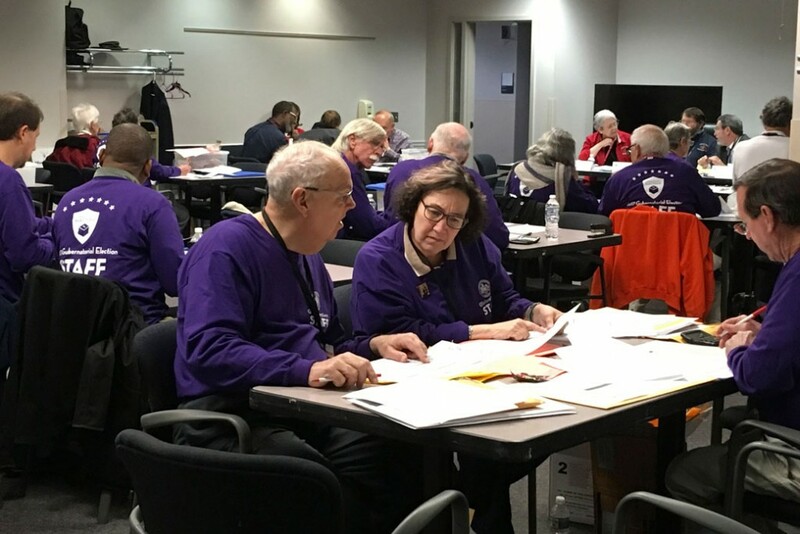 In addition to Oregon, some form of AVR has already been adopted in 9 states and Washington, D.C.12 In Illinois, it was passed unanimously by the legislature and signed by Republican Gov. Bruce Rauner;13 in Alaska, it was adopted by voters at the ballot.14 California is scheduled to launch their program in April 2018.15 It is important to note that not all AVR systems are using Oregon’s effective policy design, which relies on a no-action default to voter registration for eligible citizens; social science demonstrates this is the best way to achieve a favored outcome.16 The impact on increasing the number of people that become and remain registered to vote will vary depending on inclusiveness of the AVR policy adopted. 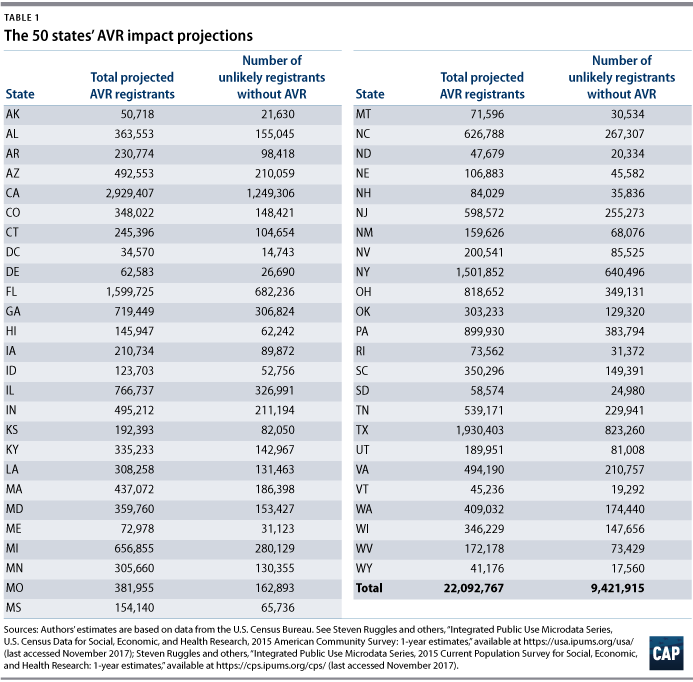 Table 1 uses estimates of AVR’s impact in Oregon to project how many new potential voters would be added per state if every state were to adopt a similar AVR system. CAP’s analysis also shows the subset of how many people in each state are likely not to have become registered to vote without AVR. The estimates reported here are derived from a variety of data sources and models. To start, we developed estimates of each state’s eligible voter population using the 2015 1-Year American Communities Survey.37 We broke the population in each of these states into 160 groups based on race, age, income, and education. From there, we estimated the registration rates for each of these 160 groups in all 50 states and Washington, D.C., using data from the 2016 November Supplement of the Current Population Survey. These rates were produced using cross-nested multilevel models that estimated the registration rate for each state, race, age, income, and education level group represented in the data. Many of these groups can be very small, but this approach provides more realistic starting estimates of registration for low-sample populations by partially pooling data across individuals’ geographic and demographic characteristics. We applied those registration rates to the eligible voter population counts in each to generate counts of the registered and unregistered populations in each state. They did not take any action in order to become registered (in this case, returning a registration postcard). With those two values in hand, we simply apply those rates to the estimated number of unregistered voters in each state to derive a) the total number of individuals we believe would pass through an AVR system in a given state as well as b) the number of those individuals who we believe would not have registered on their own. Applying these rates to other states is a simplification—in reality, the rates would vary dependent on the type of AVR system a state instituted, the demographic composition of the state, behavioral differences between state populations, etc.—but gives us a baseline to think through what the potential effects of this law might be in other states. Liz Kennedy is the director of Democracy and Government Reform at American Progress. Robert Griffin is the director of quantitative analysis for Progressive Studies at American Progress. Special assistant Gwen Calais-Haase provided research support.